No need to wait until Christmas this year to get that new tablet you have been eyeing. 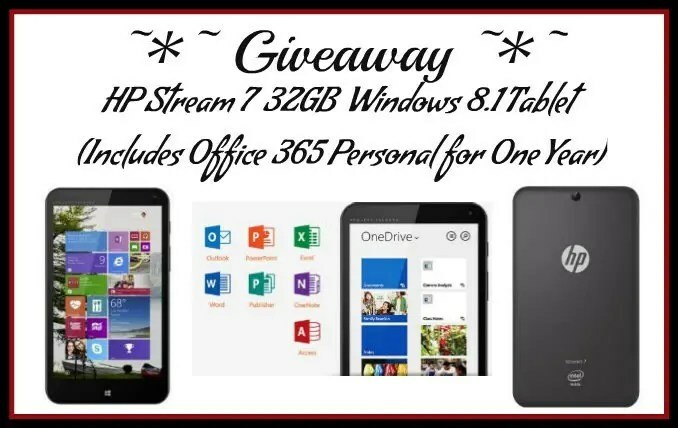 You can either buy your own HP Stream 7 Signature Edition Tablet on Amazon or you can enter to win one here… or both! This is a fantastic little tablet, that is sure to light up anyone’s holiday season. For less than $100 this tablet is a steal!!! Whether you want one for a family member, a friend, or just yourself, you can’t miss out a deal like this. In addition to all it’s great features this tablet also comes with a free year of 365 Office Personal (value for that is $69.99). Living Smart Girl, A Day in Our Shoes, Plum Crazy About Coupons, The Naughty Mommy, Rowell Reviews, Suburbia Unwrapped, The Adventures of J-Man and MillerBug, Running Loving Living, My Sentiments ExactLee, and The Weight is Over. Nice! This would be a great airplane buddy. I would use this tablet to keep up with blog reading and plan my workout schedules. My bn nook wont turn on anymore so this would be for me. I would love to use this for reading in bed and outside while my kids run around the backyard.